“Guess what I found.” That was the Facebook message I got from MJ last week. MJ is one of those people I’ve felt connected to for years but never really spent time getting to know. These days we are Facebook friends. I love her posts. 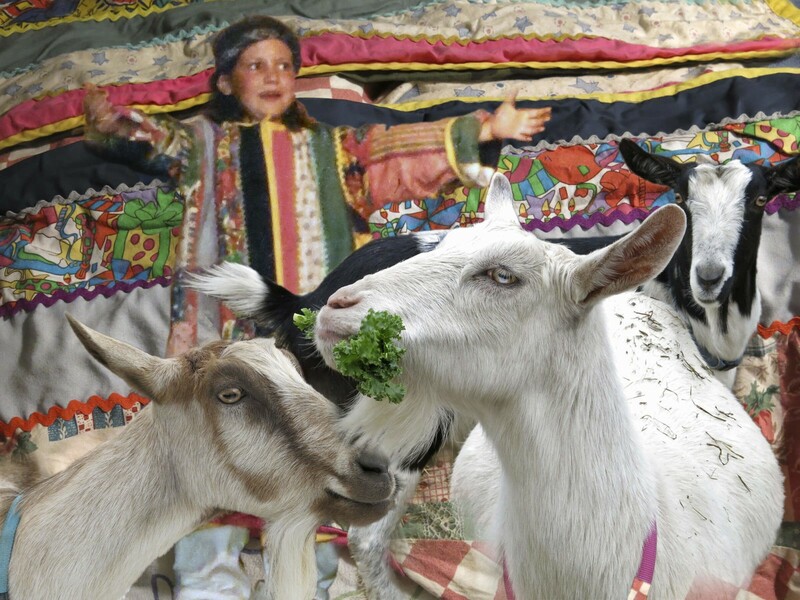 They often feature her crazy goats. We have designing and a love of fabrics in common. In the mid-1990s, MJ was sewing costumes for the Elizabeth Ann Clune Montessori School of Ithaca annual musicals while I was painting their scenery. Our daughters were both in the 1996 production of Joseph and the Amazing Technicolor Dream Coat. My six-year-old Marika got the part of Joseph and MJ created a beautiful Coat of Many Colors for her. The youngest student to get a major role in the school play, Marika spun proudly around and around on stage. It is one of the most precious images I have of my daughter who died fourteen years later. Right away from the message, I knew MJ was trying to return the big bag of fabrics and clothes I’d given her to refashion. That’s what MJ does when she has time; she sews various remnants into stunning creations. But she got a full-time job shortly after I last saw her and no longer had time to sew for herself or for others. My bag sat in her house over two years while we both were too busy to bother with it. I went to MJ’s house to pick up the bag. I was hoping to see her goats. What I got was the bag, the goats, and a magnificent gift. “This isn’t mine,” I said, pointing to a garish pile on top in the bag I immediately recognized as my own. I held up the colorful bundle and it unfolded into a coat. And I unfolded into a mess of memories and tears. What was the most thoughtful, wonderful surprise you ever received? This entry was posted in 2015 and tagged a gift from the past, coat of many colors, daughter who died, goats, Joseph and the Amazing Technicolor Dreamcoat, precious memories, sewing costumes on 2015/04/06 by Robin Botie.